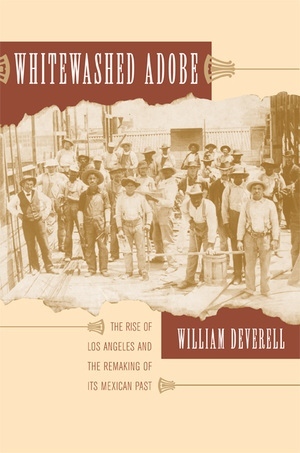 Chronicling the rise of Los Angeles through shifting ideas of race and ethnicity, William Deverell offers a unique perspective on how the city grew and changed. Whitewashed Adobe considers six different developments in the history of the city—including the cementing of the Los Angeles River, the outbreak of bubonic plague in 1924, and the evolution of America's largest brickyard in the 1920s. In an absorbing narrative supported by a number of previously unpublished period photographs, Deverell shows how a city that was once part of Mexico itself came of age through appropriating—and even obliterating—the region's connections to Mexican places and people. Deverell portrays Los Angeles during the 1850s as a city seething with racial enmity due to the recent war with Mexico. He explains how, within a generation, the city's business interests, looking for a commercially viable way to establish urban identity, borrowed Mexican cultural traditions and put on a carnival called La Fiesta de Los Angeles. He analyzes the subtle ways in which ethnicity came to bear on efforts to corral the unpredictable Los Angeles River and shows how the resident Mexican population was put to work fashioning the modern metropolis. He discusses how Los Angeles responded to the nation's last major outbreak of bubonic plague and concludes by considering the Mission Play, a famed drama tied to regional assumptions about history, progress, and ethnicity. Taking all of these elements into consideration, Whitewashed Adobe uncovers an urban identity—and the power structure that fostered it—with far-reaching implications for contemporary Los Angeles. William Deverell is Professor of History at the University of Southern California and Director of the Huntington-USC Institute on California and the West. He is the author of Railroad Crossing: Californians and the Railroad, 1850-1910 (California, 1994); coauthor of The West in the History of the Nation (2000) and Eden by Design: The 1930 Olmsted-Bartholomew Plan for Los Angeles (California, 2000); and coeditor of Metropolis in the Making: Los Angeles in the 1920s (2001) and California Progressivism Revisited (1994), both from California.